I first caught wind of Josh Noel's book months ago. It peaked my interest because I've followed the antics of Anheuser-Busch in craft beer space for many years. You know this if you stop by here occasionally. I preordered the book on Amazon and it arrived just prior to last week's trip to Kauai. Perfect timing. The book is not yet in full release. That evidently happens on June 1. It looks like Amazon is still handling it as a preorder, though, as I say, the copy I ordered months ago arrived in my mailbox about two weeks ago. Whatever. First, I don't know Josh Noel and was not interviewed for his book. One of my blog posts from several years ago is referenced, but that's it. My friend, Jeff Alworth, received an advance copy a while ago and told me it was great reading. He was right, a rarity. (I kid.) Read Jeff's review here. Noel, who writes about beer and travel for the Chicago Tribune, interviewed seemingly hundreds of people and consulted a pile of print, electronic and related sources while prepping for the book. As with all such projects, the research likely took significantly longer than the actual writing. Situation normal. I don't want to give too much of the book away. Please support the author by purchasing a copy. The tale is essentially divided into two parts. 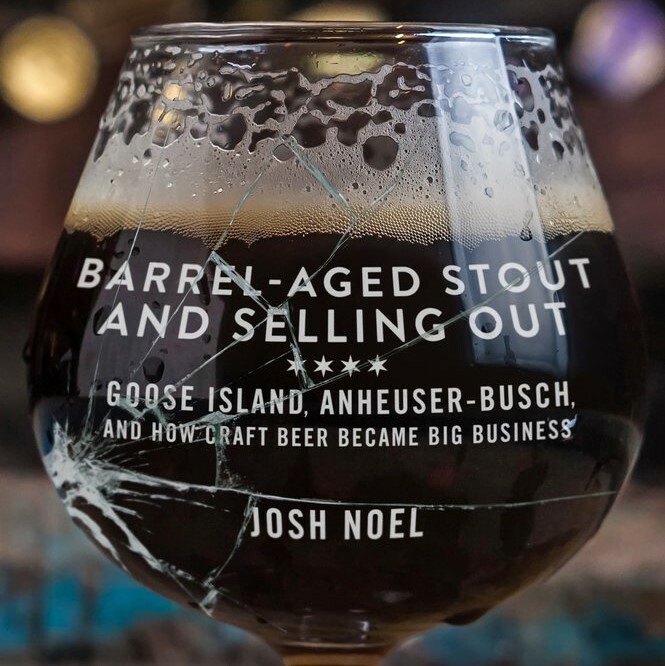 Most of the first half of the book focuses on how John and Greg Hall (father and son) built Goose Island Brewing into a highly respected craft brand. The second half covers the aftermath of Goose Island's sale to Anheuser-Busch in 2011. It's clear early on that John and Greg Hall are polar opposites. John is the steady, conservative hand steering the company; Greg is the wildly creative, undisciplined and unstable force who invented a great line of beers, including Bourbon County Stout, a beer that transformed the way we think about barrel beer in this country. By 2010 or so, Goose Island was at a crossroads. It simply could not keep up with the demand for its mainstream beers, while also maintaining production of its high end specialty beers. They needed money in some form to expand. John Hall, 45 when he launched the brewery, was nearly 70. Thinking about the next 10 or 20 years wasn't in the cards. There was no succession plan at Goose Island. While many employees and outsiders assumed Greg Hall would eventually take control of the company, that was not the plan. Some will consider Greg to be the tragic figure in this story. In fact, it's fairly clear that he was was not suited by temperament to run the company. He was strictly a creative guy. The result of that reality is that John Hall elected to sell a controlling share in Goose Island to Anheuser-Busch. Portland-based Craft Brew Alliance, which owned a 42 percent share in Goose, eventually sold its share for $16 million in cash, plus reduced distribution fees worth millions more (the CBA was a third owned by AB at the time). In the wake of the buyout, Noel shifts to covering multiple facets of what transpired. The Brazilians running Anheuser-Busch (absorbed by InBev prior to the Goose Island deal) had no idea how to operate a craft brewery. They bullied employees, bungled marketing tactics and generally mangled the Goose Island brand. But Goose Island served as a sort of test case. As Anheuser-Busch bought more craft breweries, its experience at Goose was significant. The cautionary tale for craft beer fans is that the Brazilians have been good learners. They've modified and refined their approach with the acquired brands. To a significant extent, they actually know what they're doing now. It seems to me that Noel's views on big beer vs craft are readily apparent. But you'll have to read the book and judge for yourself. If you care about the beer industry and the future of craft beer, you'll enjoy this book. Please buy of copy at your local independent bookstore or online, if you must. It's well-worth the investment. Actually, Portland had only one operational brewery at the end of 1984. That was Bridgeport Brewing, known at the time as Columbia River Brewing. Portland Brewing didn't open until March 1986. Full Sail (originally Hood River Brewing) didn't open until 1987, and not in Portland; Widmer was prepping to open in 1984 and eventually did in April 1985. But Hefeweizen was not the Widmer Brothers intended flagship. That honor belonged to Altbier, which proved to be a hard sell. Hefeweizen became the Widmer flagship largely by accident a year or two after they officially opened. Regardless of that misstep, Noel has put together an excellent book that will be of interest to craft beer fans and industry observers. I regard it as essential reading.